My very first marathon was running the Chicago marathon. The crowd support in over whelming. I pace to help others achieve there personal goal. Crossing the finish line with a group of followers and they approach you and say thank you fro helping me. I try to make it as fun as possible. I check on my runners and give them the support and encouragement they need to finish the race. Don’t worry about the time or you pace. That’s my job. Just enjoy the run and scenery. It is very satisfying to help others achieve there goal of completing their first, second or 100th marathon. There is nothing like crossing the finish line and seeing the emotion on peoples faces after they have crossed. That is what makes pacing worth while. 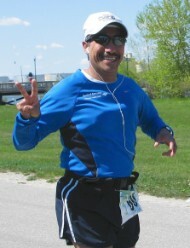 I am a member of the Opportunity Enterprises Marathon Team located in Valparaiso, IN. which helps mentally and physically challenged individuals.